Apple MacBook Pro ME866LL/A is the new 13.3-Inch addition with Retina Display and Haswell i5 processor to the Macbook range. Battery life is better, graphics performance is better, flash drive is faster and overall performance is better than before. Everything runs so so smoothly. Fourth-Generation dual core Intel i5 Processor with 3MB shared L3 cache at 2.6GHz speed that goes up to 3.1GHz in small increments depending on the task you're working- when you need more power for processor intensive applications and the energy requirements of the system. So it finds a great balance between energy usage and performance. 8GB at 1600MHz DDR3L SDRAM onboard memory meets all your multitasking demands while 512GB PCIe-based flash storage helps everything run smoothly and quickly- system boots up from zero only in seconds. 13.3 inch LED backlit screen with IPS technology at 2560x1600 pixel resolution, fits well over 4 million pixels (227 pixels per inch) into the amazing display and it supports millions of colors. This is the world's highest resolution laptop display after all. Intel Iris Graphics also help images and texts appear extremely sharp with the finest details. IPS technology is for a 178-degree wide viewing angle. 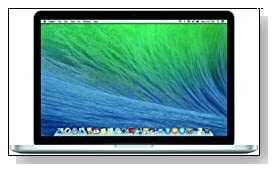 Mac OS X Mavericks is the operating system on all of the new Macbook Pros and it will only help you experience the best of everything as it is classified as the most advanced desktop operating system on earth after all. You also have an extremely responsive multi-gesture trackpad to work on the OS X Mavericks and its wide array of useful apps and features. Power Nap technology is especially interesting, as it helps keep your system completely up to date while it is asleep. You get up to 9 hours of battery life on the new Macbook Pro, thanks to the energy efficient Haswell processor and the Flash technology. It is only 3.46 pound heavy and is 0.71 inch thick, so it is extremely portable with also its 13.3 inch screen. Two ultra-fast Thunderbolt ports that allow you to daisy-chain up to six peripherals without needing a hub, two USB 3 ports, new 802.11ac Wi-Fi for up to 3x faster wireless, an SDXC card slot, an HDMI port, native Mini DisplayPort output compatible with VGA, DVI, and dual-link DVI, MagSafe 2 power port, a 720p HD FaceTime camera, headphone port, stereo speakers, dual microphones, support for Apple iPhone headset with microphone and for digital/analog audio line out as well as Bluetooth 4.0 are what you're offered in terms of connectivity. Verdict: The new Apple MacBook Pro ME866LL/A is faster, more powerful, more capable, lighter and slimmer than before. It has the latest technology everything: From the world's most advanced operating system to the highest resolution screen.. It has a longer battery life than before and a much faster flash storage. We are actually still finding it hard to believe how Apple engineers managed to fit so much in such a small space. This is a piece of art with the best looking design and you're going to be proud of owning it.